On Thursday the 21st March (the UN International Day of Forests), in London and New York City, people grouped together with banners, orangutan masks, cameras and orangutan toys to protest for Mandarin Oriental Hotels to break its complicity in the destruction of Tapanuli orangutan’s habitat in Indonesia. 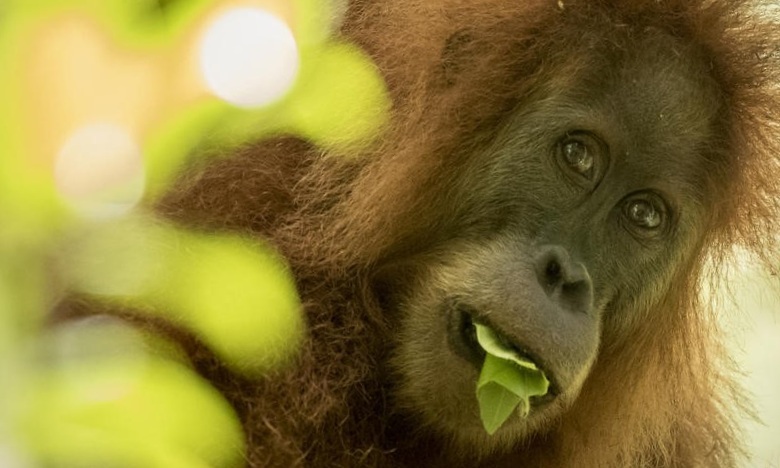 In 2017, scientists identified the Tapanuli orangutan (Pongo tapanuliensis) as a distinct species. This sensational discovery marked the first time since 1929 that a new great ape species has been discovered. The Tapanuli orangutan is a species of orangutan restricted to South Tapanuli in the island of Sumatra in Indonesia. Tapanuli orangutans resemble Sumatran orangutans (Pongo abelii) more than Bornean orangutans in body build and the lighter fur colour. However, this species has smaller heads and flatter faces. Unlike the Bornean orangutan (Pongo pgymaeus) both male and female Tapanuli orangutans have beards. With just 800 Tapanuli orangutan individuals left they now face an imminent threat of extinction. They are the most endangered Great Ape in the world. Mandarin Oriental’s parent company Jardines Matheson owns a gold mine in the heart of the Tapanuli’s territory in the Batang Toru forest. This gold mine needs electricity which is the reason to why the hydroelectric dam was proposed. Despite the dam being hydroelectric, it will cause irreversible and catastrophic effects not just for the survival of the Tapanuli orangutan species, but to the livelihoods of those living nearby, as well as the fact that it would be located on a geologically active area, further risking the large scale and devastating risk of flooding in the Batang Toru forest. The proposed Batang Toru dam would permanently dragment the Tapanuli’s only habitat, leading to a near certain extinction. This is where we came in. Ape Alliance, lead by Ian Redmond (OBE) has been holding letter writing workshops over the last few months in Bristol, UK. Letters addressed to the Bank of China, calling them to withdraw its funding of the massive hydroelectric dam that would obliterate this species were sent en mass, alongside posters made by pupils from schools across the globe, a petition with over 120,000 signatures and an overall groundswell of public support. As a result, the Bank of China officially agreed to negotiate. In light of our concerns, The Bank of China are seriously reviewing whether or not to fund the Batang Toru dam. The Bank of China has agreed to send executives from their Indonesia branch to a formal roundtable with all relevant NGO’s, a meeting that will take place later this month in London. Despite this huge result in connection with the Bank of China, the protest went ahead to focus pressure on Jardines Matheson to use it’s influence justly to promote the use of the nearby geothermal plant instead of damming the river to create energy for the gold mine. Moreover, Mandarin Oriental’s sister company Astra has the influence with the Indonesian Government needed to stop the Batang Toru dam - yet they have not acted yet. Outstanding progress has been achieved in the protection of this critically endangered great ape and its sacred and ancient forest home, but the battle is not over. Help spread the word by adding to the pressure for Jardines Matheson and other corporations to put conservation as a priority. #SaveTapanuliOrangutan.